Spring has finally sprung! It’s finally warming up, the daffodils are out and Summer, with its’ gorgeously long days of beaches and barbecues is just around the corner. But before that, the annual Spring Clean has to take place. 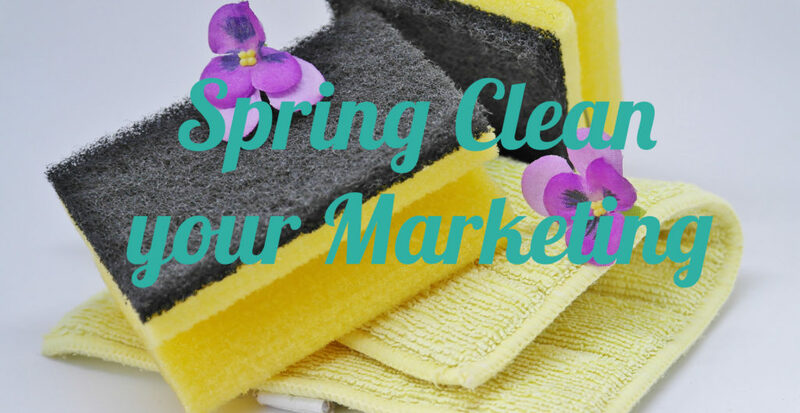 Spring is the perfect time for take a look at your Marketing and give it a polish where needed. When did you last give your Website a once over? Make sure you give yourself ample time to fully review it and look at it from a client’s point of view. Does it still reflect your offering? Are there are any broken links? Are your keywords working for you? Does it still look as fresh as it did when you first designed it? There were a lot of changes last year that impacted Digital Marketing, so now is a great time to see how that affected you. Are you mailing lists still ok to use? How does everything tie in together? Can you automate any aspects of your marketing? What digital developments are on the horizon? Are all your Profiles up to date? Have you added your most recent qualifications/achievements? Is there too much of a crossover between your personal Facebook and Business Page? Do you still need all your Social Media accounts? Do you have a strategy in place for Social Media Marketing? How are you tracking Social Media effectiveness? Spring is the perfect time to evaluate all these questions and make sure you’re in a strong place for the rest of the year. Compelling content is essential so take stock of what you have already created and check whether it is still fit for purpose or if you could make it more compelling in some way. Don’t rest on your laurels when it comes to creating new content. Get yourself a content calendar and plan ahead. Of course, Spring Cleaning may not be your forte at which point it may well be time to outsource to an experts or sticking with the spring cleaning analogy, it could be time to hire professional cleaners. Outsourcing some or all of your Marketing can allow you to focus your time on other areas of your business. By bringing in an expert to review your current marketing situation and to give you a kick start for the rest of the year is often a lot easier than tackling the whole project yourself! ← Make blogging your business resolution this year!